Pumkins are a great way to show off your artistic flare at Halloween. I actually tried to persuade Kelly to let me buy ‘two’ pumpkins at the weekend – but she was having none of it! Asda is possibly your cheapest bet for a good sized pumpkin at a cheap price. Other places you can purchase that must have pumpkin are grocery stores. 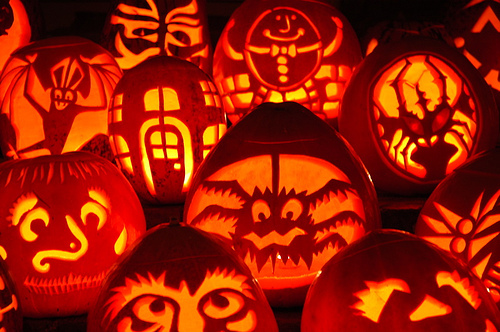 Pumpkins can be decorated in all sorts of ways, but be extremely careful when carving them! Be sure to make your pumpkin look as scary as possibly, and don’t forget to light the inside of your pumpkin with a candle – alternatively you can go all out and light your pumpkin with LED lights, as these are much safer! Using glitter on your pumpkin can really set that illuminated look off – be as creative as possibly and you can’t go wrong. 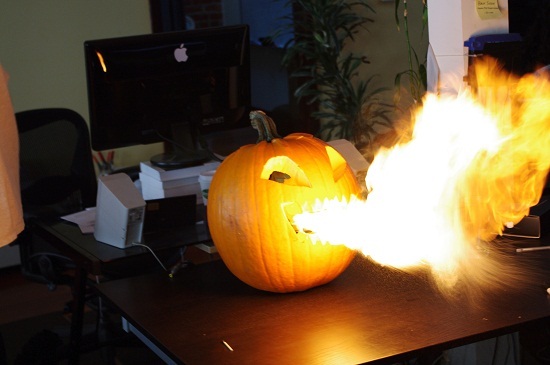 Always remember when designing your Jack-O-Latern, DO NOT go too outrageous – fire is dangerous! Be sure to have plenty of sweets at hand for those Halloween kids. There are plenty of cheap places to shop for cheap sweets in the UK, Pound Land is just one example of a great shop which supplies a variety of mixed bags of sweets – perfect for those little Halloween monsters! Make sure you have a huge selection of treats – lollipops and chews are perfect, and kids love them! In the UK, this can either go one way or the other! Decorating your house to the extreme is bound to either grab the attention of the kids in your neighbourhood on Halloween, or scare them away! Just be sure to follow our above tips, and don’t dare to disappoint those little scary faces, and your Halloween night will be a huge success! One last thing, be sure to dress up yourself on Halloween. The scarier, the better! Michael Myers is always an easy outfit to put together, after all, all you need is a white face and a pair of blue overalls! Alternatively witches are always fun, especially if you have a black cat who loves to see who’s at the door – black cats always add to the effect on Halloween. Remember to have fun, and remember that Halloween is a time for celebrating the spirits who ‘supposedly’ are lined up by Samhain and sent to visit the living – or something along those lines! Anyways, have fun carving your pumpkins (or jack-o-lanterns). Careful not to cut yourself with those sharp knives when carving! 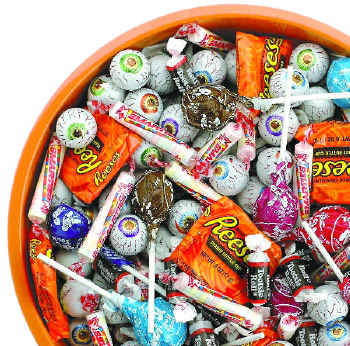 Have fun with the kids, and don’t be a spoiled sport – give the kids plenty of candy! 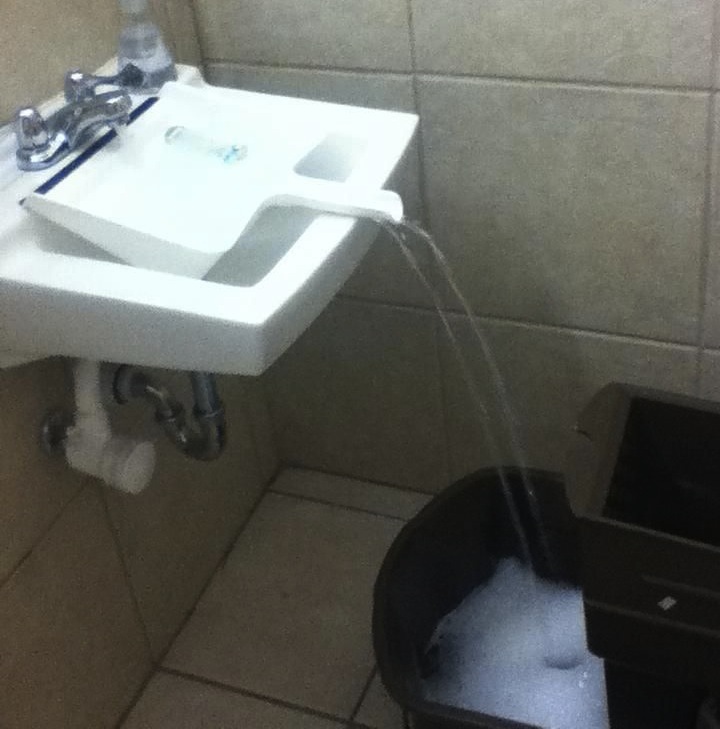 Don’t you just hate it when you can’t fit your bucket (or container) in to the sink!? When we came across this idea, courtesy of Miss Maura, we thought what an awesome idea to something which is so annoying! Basically, all you need to do is take a ‘clean’ dustpan and place it as shown above under the sink basin taps. We recommend that you ensure your bucket is placed on the floor before turning on the tap! Any of our fellow bloggers got any cool tips and tricks like this one? Feel free to share comments below!